Here’s a thought: you can’t write a blockbuster to order. In fact, you don’t know that a book will become a blockbuster until after it’s become a bestseller, and the two aren’t necessarily synonymous. 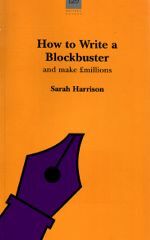 However, as Sarah Harrison is quick to point out, there are certain things you can do to encourage your novel towards becoming a blockbuster. As someone whose book beat Jeffrey Archer’s to the no.1 bestseller slot, she’s better qualified than most to tell us what they are, which she does in her own extremely entertaining style. So what makes a blockbuster? Go out and read a few, advises Harrison, and if you don’t want to, then maybe you should think about writing something else altogether. But here’s a clue: everything about a blockbuster is big, from its size to its appeal, its scope to the impact it makes on the reader. There is no room for half-measures in writing a blockbuster, so it seems likely that delicate water-colour studies of a fragile relationship are unlikely to provide good subject matter for a blockbuster. On the other hand, pursuit of a lifelong love across three continents through political upheavals is probably a good place to start, and it’s surely no coincidence that Harrison’s first successful novel was an epic set in World War One. For Harrison, the first and most important thing is the idea. Ideas are like timid animals, needing to be stalked, all sightings noted and filed away somewhere. Unusually, when writers are so often advised to keep copious notebooks, Harrison rarely notes down her ideas but stuffs them away in a corner of her memory, creating a jumble of thoughts and notions which gradually come together to produce something even bigger and better. Having said that, she has no doubt that certain times and certain places are more fertile ground for blockbusters than others, and that some milieus can be very productive – think Jilly Cooper and riding. And vitally important is the book’s theme, providing the underlying impetus for the novel. Having established all this, Harrison turns her attention to the business of planning the novel. Unlike some writers, she doesn’t plan every detail before beginning to write, but neither does she believe that a writer can start a book ‘cold’. Some sub-conscious planning surely goes on and there is therefore no harm in formalising it just a little. After all, you don’t have to follow the plan slavishly once you get started, do you? Nevertheless, it helps to know which direction you’re setting off in. Similarly, it helps to know about your characters, as they will be carrying the burden of the novel for you. What are they called, what do they do, what do they look like, and what do they feel about X, whom they’ve only just met? All these clues pile up to create the riveting character, and Harrison expertly navigates the reader through this all-important process. Perhaps the hardest part of writing a novel is the day-to-day slog of getting it done, particularly when you’re dealing with a book that’s big in every respect. Needless to say, there are no shortcuts. Harrison is sympathetic to the writer’s plight but the book still has to be written, and there is nothing to do but to sit down to it each day and write. However, there are some tricks to make the process more bearable and Harrison offers a few of them, from barricading yourself in a room without a telephone to working a set number of hours per day, and to hell with what other writers claim to do. And then the fun begins. Your book’s done, it’s sold, and now you have to sell it all over again because, as Harrison notes, the great and unavoidable truth is that a book is indivisible from its author and so, unusually for a book of this nature, she describes the process of promoting the novel, setting it alongside the problems created by the fact of the book being finished. It’s an interesting and unexpected glimpse of the downside of the writer’s life but a reminder too that the best thing to do is to start writing again. In setting out to write this book, Sarah Harrison defined her task as being to put the writer in the right frame to write. With a book that is so honest and straightforward in its approach, so cheerfully cynical, it’s difficult to find yourself in anything but the right frame of mind.